You are here: Home / News from Madrelingua Italian Language School / A ticket from Bologna to Florence, please! A ticket from Bologna to Florence, please! Studying Italian at a language school in Bologna is ideal for many reasons, not least because, as a major rail hub, it makes the perfect base for visiting many other wonderful Italian cities. When I’ve finished my homework, that is! So, today’s Saturday and I’m off to “La culla della Rinascimento”: Florence. My Bologna-Florence high-speed rail ticket costs about 25 euros and the journey is less than an hour, city-center to city-center! Florence is totally charming! I hardly know which way to look because there are so many beautiful things to see and I really don’t want to miss a thing! My tour starts from “Piazza di Michelangelo”, a large, quiet square above the city, from which there’s an unmissable view of the old town. From there, I head directly to the most exciting and interesting part of the city. Of course, I have to see “Ponte Vecchio”, the oldest bridge in Florence and the only one to have survived the Second World War. Close by, I find one of the world’s most famous museums, “Il Museo degli Uffizi”. Unfortunately, I don’t have the chance to see inside. Even if you’re not a big fan of museums it’s supposed to be well worth a visit, so if you’re going to be Florence, do try to be better organized than I was! Next stop, “Piazza della Signoria”, in front of the Palazzo Vecchio, one of the most important parts of the city, as all important events seem to be held there. Don’t miss the amazing replica of Michelangelo’s famous sculpture, “Il David”. 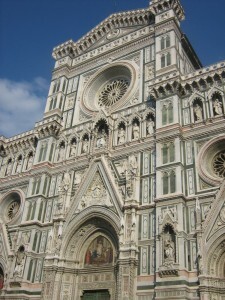 The “Cattedrale di Santa Maria del Fiore” is impressively large. And around the back you’ll find the “Campanile di Giotto”, where you can buy a ticket to go on the top and admire Florence’s wonderful cityscape. In front of the Cathedral there’s another monument, “il Battisterio di San Giovanni Battista”, also well worth seeing. Florence is famous as a city of art, but it’s also renowned for its literature. Don’t forget that Dante Alighieri, the “father of Italian Literature”, was born there…and you can even visit his house! OK, that’s more than enough culture for one day! Time to try one of those amazing ice creams that everyone seems to be eating. And I do think it would be a shame not to sample the local speciality “bistecca fiorentina” ( an enormous t-bone steak) before heading back to Bologna and to my language course! 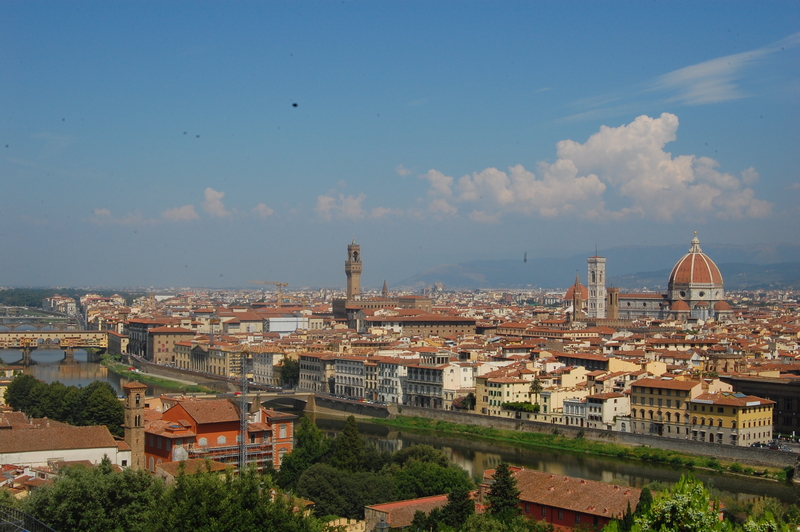 Have you visited Florence? Which Italian city is your favourite? Leave a comment. I always enjoy reading your emails. Although I travel to Italy about every other year and love the Tuscany region, my favorite city is Venice especially off season (Is there an off season?). Florence is culturally wonderful. But the last time I was there I received 2 tickets, one for parking in a zone for locals and another for driving in a zone forbidden to drivers during a specific time of day. The tickets came 6 months later in the mail. It left a bad taste in my mouth. The next time I go to Florence I am going to use the train as Agata did. You live and hopefully learn. Thanks for your kind comments, Lee, and sorry to hear about your mishap. Yes, what with the price of fuel and motorway tolls these days, taking the train makes sense. And you don’t risks fines, or have to pay for parking!